William Sasquatch has been following the Cam Newton case and I (Larry) am here to interview him on his thoughts and get a conclusion from him on the whole thing. ME: Where should a reporter start on this story. WS: WITH THE MONEY. CAM NEWTON'S FATHER WANTED MONEY TO GO TO MISSISSIPPI STATE. PAY FOR PLAY, SO TO SPEAK. THIS IS WHERE THE STORY STARTS AND ENDS. ME: So the investigation is closed? It's over? WS: YEP. REPORTS ARE SHORTSIGHTED AND NARROWLY FOCUSED. FOLKS NEED TO LOOK AT THE TIMELINE AND THEY ALSO NEED TO BRUSH UP ON SOUTHERN CULTURE. CAM'S FATHER IS A 'BISHOP' OVER A CLUSTER OF CHURCHES IN GEORGIA. ONE OF WHICH WAS CONDEMNED. HE WANTED MONEY TO SAVE THE CHURCH BECAUSE THE MONEY HE WAS GETTING TO SAVE IT WAS COMING FROM CAM'S BROTHER WHO WAS ON THE PRACTICE SQUAD FOR THE JACKSONVILLE JAGUARS. HE WAS CUT, NO MORE MONEY TO SAVE THE CHURCH. CAM'S FATHER NEEDED MONEY FAST SO HE LOOKED AT CAM AS A WAY TO GET IT. IT DIDN'T WORK. 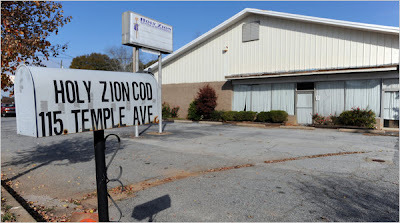 NO MONEY AND THE CHURCH WAS CONDEMNED. IT SITS ABANDONED NOW. ME: Cam didn't get any money then? WS: WELL... NOT FOR SIGNING AT ANY SCHOOL. CAM IS A GREAT PLAYER WITH A EDUCATION PROBLEM. THE FLORIDA GATORS TOOK A CHANCE ON HIM. HE ENDED UP PLAYING BACKUP TO TIM TEBOW, THEN GETTING INJURED AFTER THAT CAM PROCEEDED TO STEAL ANOTHER STUDENTS LAPTOP. HE WAS CAUGHT AND FLORIDA DUMPED HIM. HE WOUND UP A BINN COLLEGE JUCO PLAYER. ME: Isn't this where the Miss. St. money comes in? WS: THERE ISN'T ANY QUESTION THAT CAM'S FATHER WAS TRYING TO GET MONEY THE WHOLE TIME CAM HAS BEEN IN COLLEGE. IT DIDN'T WORK. WHY DO YOU THINK HIS SON FOUND HIMSELF STEALING A LAPTOP AND PLAYING AT A JUNIOR COLLEGE IN TEXAS. ME: Makes sense I guess. But he ended up at Auburn. WS: YEAH. HE WAS CLASSIFIED AS A 5 STAR RECRUIT WHILE AT BINN COLLEGE. LOOK, PLAYERS THAT PLAY AT A DIV. I SCHOOL THEN GO JUCO HAVE ISSUES. AUBURN TOOK A CHANCE ON HIM LAST YEAR. A VERY COMMON THING IN THE SEC. BY THIS POINT THE CHURCH IN NEWNAN, GA WAS SHUTDOWN. NOW CAM IS PROBABLY THE CLEANEST PLAYER IN BIG TIME DIV. I FOOTBALL. HE ISN'T GETTING ANYTHING OUTSIDE WHAT AUBURN GIVES HIM. WHICH IS PROBABLY CONSIDERABLE, BUT NOT OUTSIDE THE RULES. CAM'S FATHER WILL BE SET NEXT YEAR WHEN CAM GOES PRO. WS: YEP. IT'S A MESSY STORY. USUALLY YOU'LL SEE SOMETHING LIKE THE REGGIE BUSH THING WHERE THE MONEY ACTUALLY HAPPENED. IT DIDN'T IN THIS CASE. IF IT DID THEY CHURCH WOULD HAVE STOOD AND CAM WOULDN'T HAVE FOUND HIMSELF AT 3 DIFFERENT SCHOOLS. WS: THE STORY IS ONE OF FAILURE. THE SEC USUALLY SWOOPS IN AND CODDLES PLAYERS LIKE CAM NEWTON. I DON'T LIKE CAM NEWTON AND WOULD LIKE TO SAY THERE IS SOMETHING HERE OTHER THEN HIS FATHER ASKING FOR MONEY BUT THERE ISN'T OTHER THEN REGULAR SEC CLOAK AND DAGGER CLOSED DOOR STUFF. ME: Isn't that the story then? The SEC? WS: THAT'S FUNNY. YOU WANT TO TAKE THAT ON? ME: Yes. You can because you are imaginary. WS: THAT'S CORRECT, BUT I HAVE AN IMAGINARY HELLTOWN BREWMASTERS UNITED GAME TO GET TOO AND YOU ARE WASTING MY TIME. 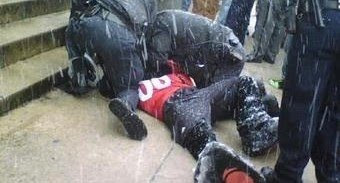 BESIDES, THE REAL COLLEGE FOOTBALL STORY RIGHT NOW IS THE CINCINNATI BEARCAT MASCOT GETTING ARRESTED FOR THROWING SNOWBALLS AT PITT PLAYERS YESTERDAY. billy sasquatch knows things no man will ever.